The sheriff investigating a mass shooting at an Oregon community college that left at least nine people dead posted a video to Facebook in 2013 that raised questions about the Sandy Hook Elementary School shooting. 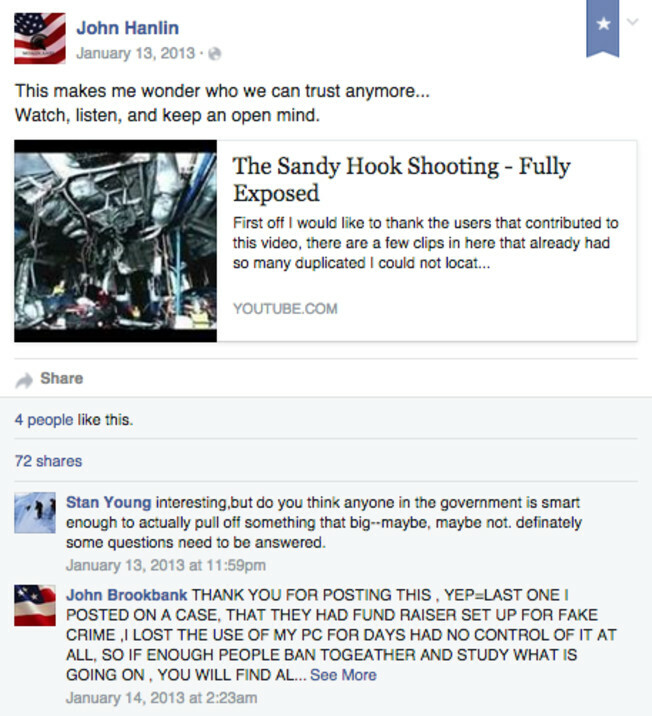 Douglas County Sheriff John Hanlin posted a link to a YouTube video called “The Sandy Hook Shooting – Fully Exposed,” which summarized conspiracy theories surrounding the shooting and quickly racked up millions of views, about a month after the massacre took place. The post was deleted or made private sometime after 2:30 p.m. Friday. The viral video was quickly debunked in arenas as disparate as The Huffington Post and Glenn Beck’s website TheBlaze, however. Two days after posting the debunked video, Hanlin sent a letter to Vice President Joe Biden in which he expressed his view that stricter gun control measures would do nothing to prevent future massacres. He went on to suggest that he would not enforce executive actions or federal legislation regarding gun control. The letter earned Hanlin praise from the Constitutional Sheriffs and Peace Officers Association(CSPOA), a fringe group somewhat similar to the Oath Keepers in that its members swear an oath to “uphold and defend” the Constitution. 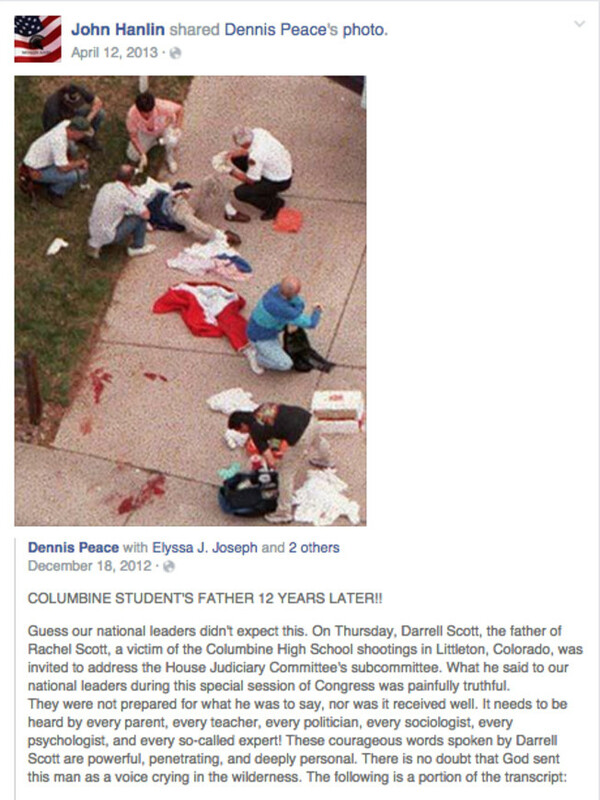 A few months after Sandy Hook, Hanlin shared an account of a Columbine shooting victim’s father’s testimony before Congress. The account he shared dated back to a 1999 email chain letter that was accurate in quoting the victim’s father but mischaracterized Congress’ reaction to his statement as negative, according to Snopes. 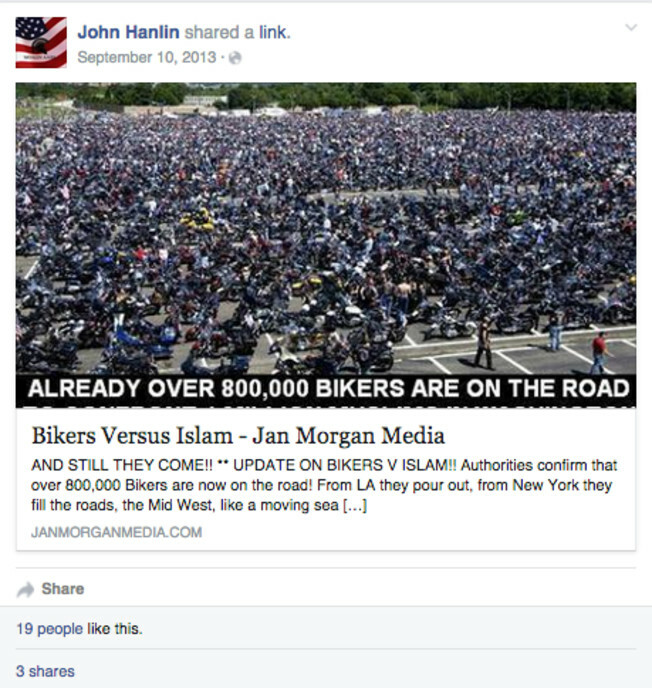 Hanlin expressed support for a “Biker Patriot Army” that planned to confront “1 million Muslims in Washington” on the anniversary of the Sept. 11 terror attacks. 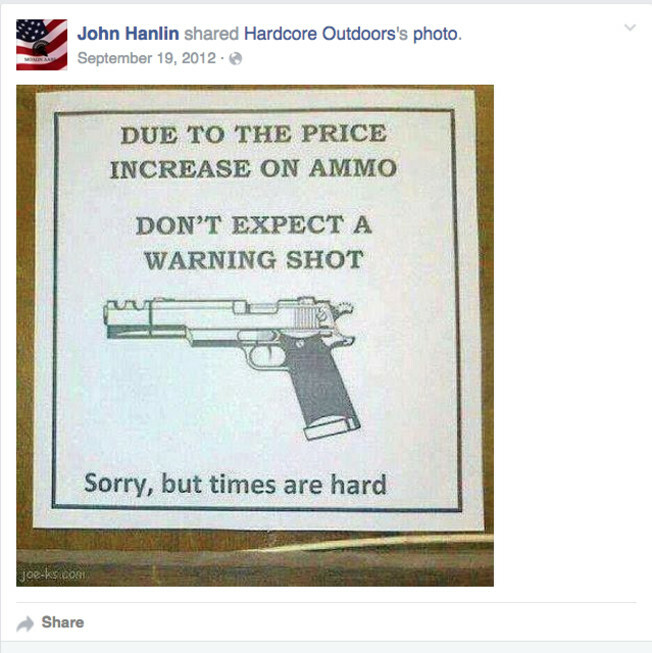 Many of Hanlin’s posts involved sharing memes supporting gun rights.